Alfred was born in Newbury in late 1880 the oldest son and child of Alfred Brazier and his wife Louisa (née Coath). Alfred senior and Louisa married in London in 1878 and set up home at 6 Montague Place in Newbury (Alfred’s home town). They had three children (Alfred jun, Mabel, born 1883, and William, born 1884). At some point Louisa became ill to the extent that she was classified as a lunatic in the family’s census entry in 1891. The same census shows that Ellen Knott was staying in the Brazier house on census night, classified as a ‘visitor’. Ten years later she was still there (though the household had moved to Pound Street) as Alfred’s housekeeper – by this date Louisa had been committed to the local asylum at Fairmile, Wallingford. However there were three visitors on census night 1901, Ellen’s children (Dorothy Knott, born 1893, Reginald Knott born 23 May, 1894, and Norah Eleanor Knott, born 3 February 1896). By the time of the 1911 census Ellen Knott’s status in the household is a lot clearer – she is listed as Ellen Brazier, Alfred senior’s wife of 20 years and mother of three of his children (Dorothy, Reginald and Norah are listed as Braziers). As Louisa was still alive in the Fairmile Asylum the Brazier’s census entry was being somewhat economical with the truth. Louisa’s children had all left home by this date, Mabel, having married Edwin Lamdin in 1910 was living at 7 Montague Place, next door to the old family home. William was lodging in St John’s Road and Alfred jun was lodging at 5 Connaught Road; both brothers were working as carpenter/joiners, following their father into the building trade. 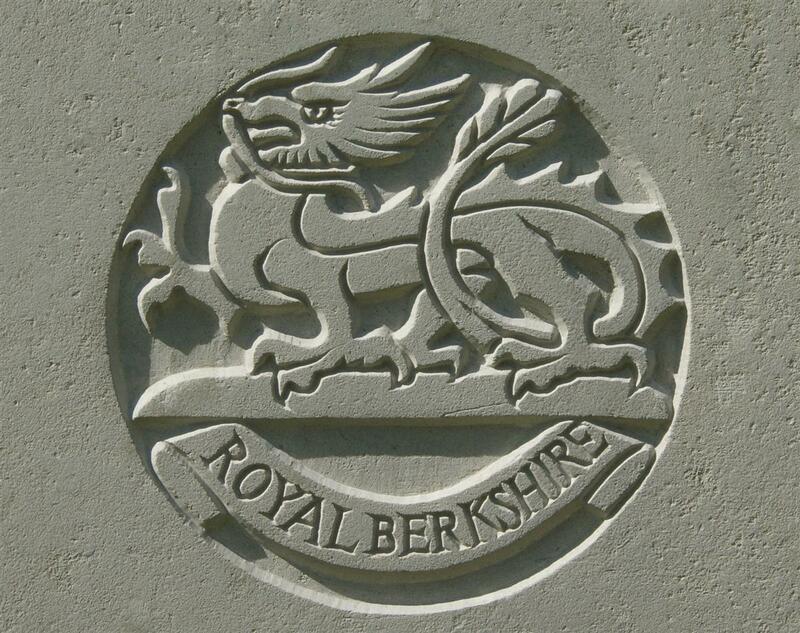 Alfred enlisted in April 1916 (probably via the Derby Scheme) and served in the 2nd/4th Battalion, Royal Berkshire Regiment. This was a Territorial battalion and its men were given new, longer numbers in 1917. As Alfred’s medal records only use this longer number it means that he did not serve over seas until after the renumbering (or both numbers would be shown). So it seems that he may not have been with the battalion for very long before they went into action during the 3rd Battle of Ypres (often referred to as Passchendaele). On 22 August 1917 the 2/4 Royal Berks was tasked with a number of platoon strength attacks on specific German strongpoints. This was an important task in support of a general attack by three brigades as the strongpoints need to be suppressed or their machine guns could wreak havoc among the advancing infantry. One of the strongpoints to be attacked was called Hindu and its capture is the stuff of legend – Pte Edwin Pike from Ramsbury somehow managed to lose his platoon, but later found the strongpoint, aiming to rejoin his comrades there. Once there he found that his comrades had not arrived and that it was still in German hands. He wounded one man who ducked into their dugout and convinced his companions that they were surrounded and would be killed if they emerged. Somehow Pike managed to keep the Germans bottled up for two sleepless days before he was relieved! He was awarded a Military Medal. The day was not entirely successful; several strongpoints were taken but the overall advance made little progress. Casualties were high – 32 killed, 27 wounded and missing, 118 wounded and 54 missing. Sunday morning’s post brought the painful news to Mr and Mrs Brazier, of Pound-street, that their son Pte A T Brazier, 4th Royal Berks had been wounded on the 22nd of August, and was missing. No particulars accompanied the official intimation. Meanwhile they are hoping that the worst may not have happened. Pte Brazier joined up in January, 1916 and went out in October of the same year. Last April he received a slight wound in the left hand, but from this he had recovered and had returned to his unit. The last letter received from him was dated August 5th, and from his long silence they had begun to be apprehensive. He was 35 years of age and single. The family’s hopes were to be dashed – Alfred was eventually presumed to have died that day. This was always likely to be the result – any soldier who was reported as wounded by one of his surviving comrades was likely to have been in too poor state to make his own way back to safety and would be at the mercy of enemy shelling as well as the lack of medical attention. The only hope was that he had been discovered by the enemy and had thus received medical treatment, which was extremely unlikely in the situation prevailing on that day. In loving memory of Alfred Thomas Brazier, reported missing August, 1917, but later officially reported killed on 28th of that month, elder son of Alfred Brazier, Pound Street, Newbury, aged 35 tears. At rest. From Mother. In 1919, during the clear up of the battlefield, his remains were discovered and identified by his ID disc and a letter found in his pocket. He was found on the approach to the German strongpoint at Hindu Cott, the target of a platoon under 2nd Lt Exler. The battalion war diary reported: The next Strong Point encountered on the Left was HINDU, 2/Lt F EXLER was wounded as soon as the Infantry advanced, but the platoon carried on and owing to the marshy state of the ground were unable to enter the Farm. However they succeeded in advancing beyond and surrounding the Strong Point, thus enabling the assaulting waves to push forward. From this it seems that Alfred was wounded relatively early in the attack unless he was making his own way back towards the British line when he finally succumbed to his wounds. His remains were interred in grave VII.G.10 at the immense Tyne Cot Cemetery near Passchendaele in Belgium. 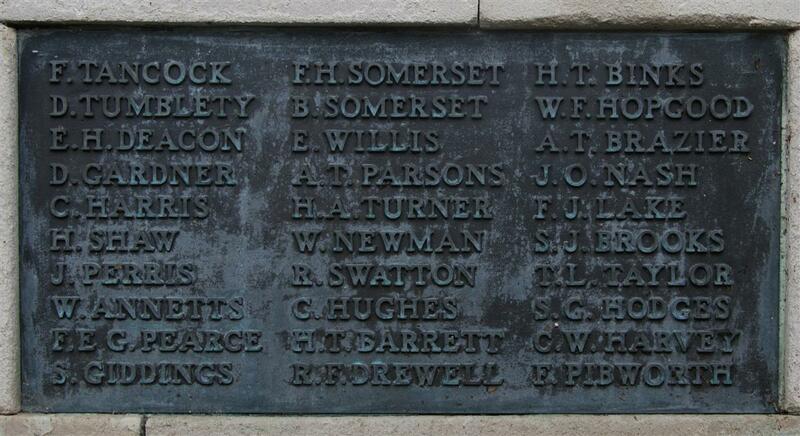 Locally he is remembered on Panel 13 of the Newbury Town War Memorial.